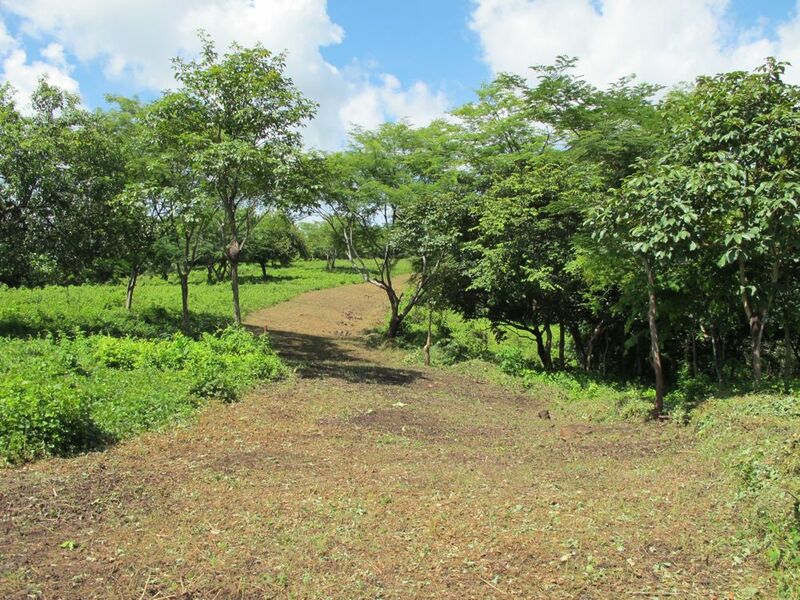 It’s been a year or more in the planning stages but we have finally broken ground on the new roads that will service lots in Tierra Del Sueno. We had been waiting to finalize the lot lines before figuring out how to create the roads that would service them. All that is finished finally, so we started looking into road options. 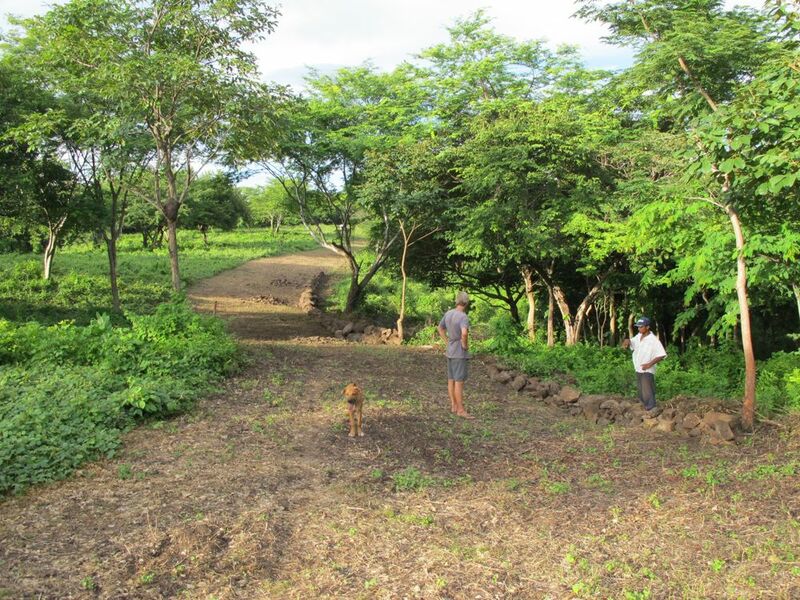 Our partners Steve and Danika felt that a loop road was important since roads in Nicaragua have a tendency to get washed out or bogged down with mud in the rainy season. 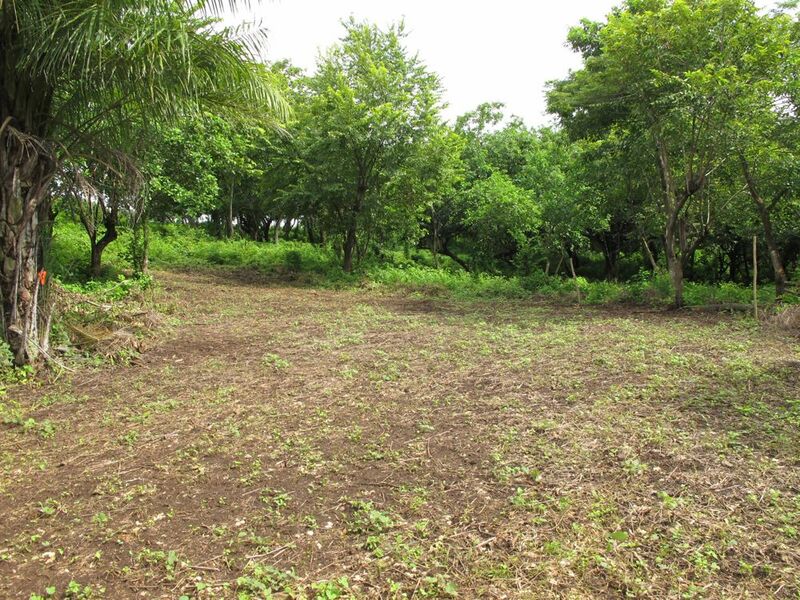 We felt that two separate roads to service the lower 3 and top 3 lots on the phase 1 ridge would be better to make the lots more private and also assure less traffic which will keep them in better shape. The deciding factor turned out to be the very steep tree-spotted section that would need to be cleared and flattened in order to make a loop road – two roads win! I met with a few different local guys who gave me quotes and opinions on how best to cut the road in and build a retaining wall to make it level. 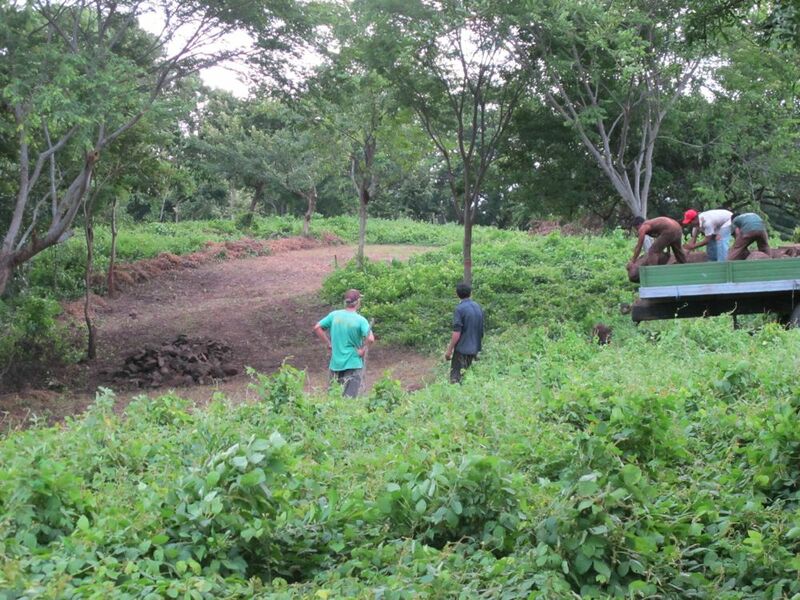 In the end we went with the most local (and cheapest) option, using the current caretaker Adan and a crew of 4 guys that he put together to first clear a 6 meter wide swath, then pull out stumps and small trees, move rocks out of the way etc. It was helpful to see the road clearly to really get an idea of the slope. The bottom section which will service lots #1, 2, and 3 is nice and flat already. The upper section has some dips and bends to it. 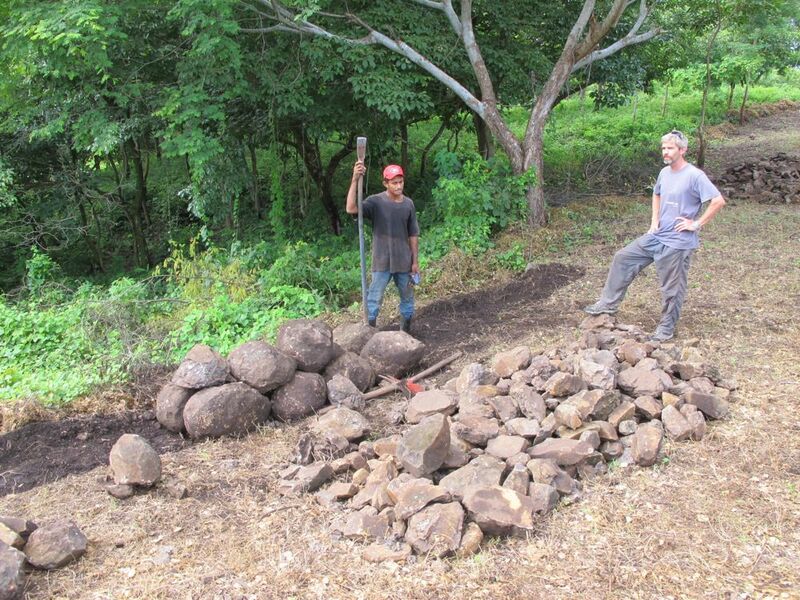 We figured we needed to build a rock retaining wall and started by having Adan and his son work with a wheelbarrow to bring the many rocks already on the property up to the ridge. It was tough work but they were able to amass an impressive pile that way. We figured we’d probably need some bigger rocks and asked around about getting some. There’s a local guy right down the road with a big truck and a hillside filled with big rocks. He delivered 2 truckloads of about 35 big rocks in each load for 4,000 cordobas total. 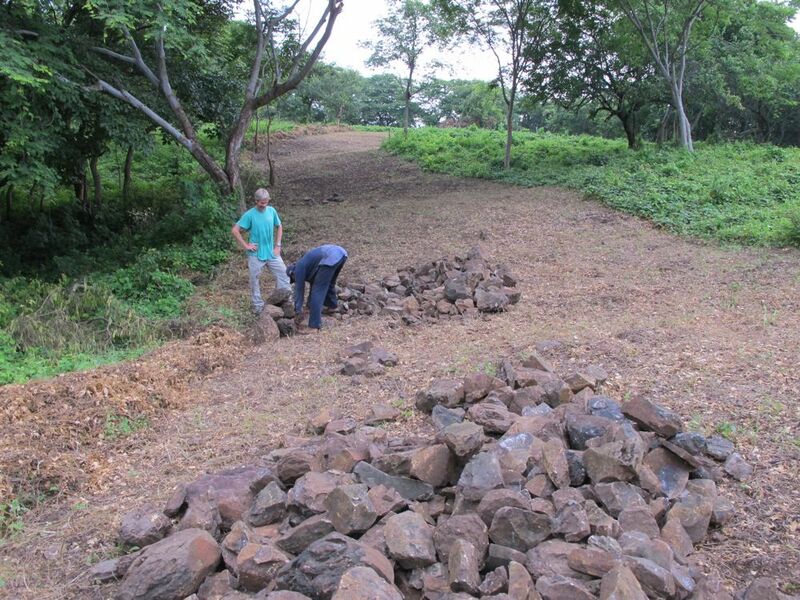 We rolled the big rocks into place, creating a wall two rocks high, that would be strengthened with the smaller rocks. In November when the ground is still soft but the risk of big rains has passed, we’ll use farming tools to break up the ground and guys with shovels to carry dirt from the higher parts and dump it into the lower parts in order to level it out. The soil is really rocky already which will give it good drainage and help keep it in place. Eventually if we need to, we’ll get a few dump loads of the rock used for roads called selecto, but we think that since the soil already has so many rocks in it and this road is only servicing 3 lots, we may not need to take that step. 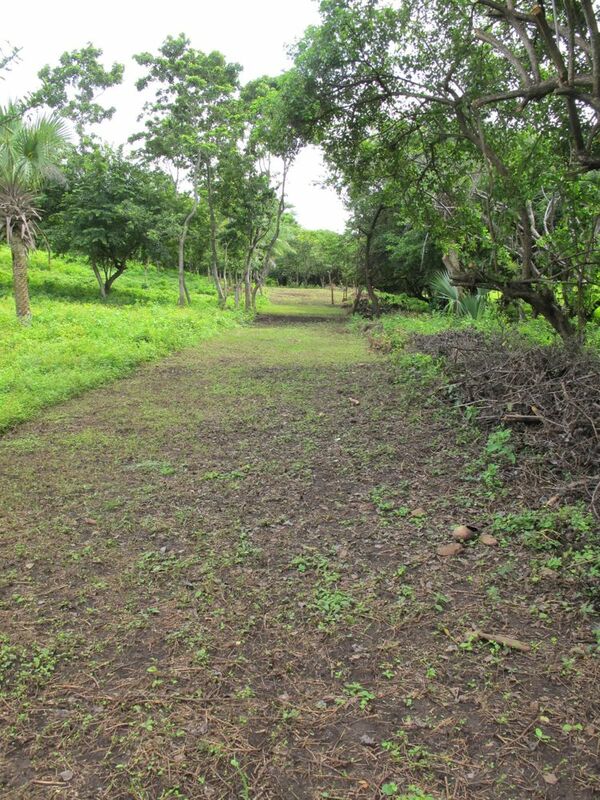 This entry was posted in Tierra Del Sueno and tagged building dirt roads, community, eco friendly, gravel roads, hipehabitat, holly beck, kim obermeyer, nicaragua, tierra del sueno. Bookmark the permalink. Day 2, Pavones house remodel. The green board is magnesium oxide not fiber cement. Way better, stronger, 100% water proof, fireproof, won’t grow mold or fungus. Pavones house (Casa Incógnito) remodel- Day 1 of many. Rebuilding a 30 year old wooden jungle house starting from the frame. Who knows what treasures await inside these walls? Hip-E Habitat is about finding ways to live simply and sustainably, spending time barefoot in the sand, eating locally and organically, going for long walks on the beach with well-behaved dogs, and constructing comfortable habitats without having to work a "real" job to pay for it all.